The Internet Corporation for Assigned Names and Numbers (ICANN) has approved eight additional new gTLDs for the release to the Internet. With the those new domains soon entering the Sunrise phase, the total number of new gTLDs has been brought to 91 new strings. 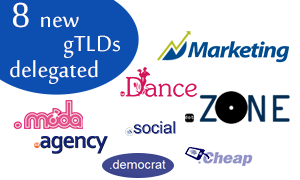 The eight new gTLDs include: .Cheap, .Zone, .Democrat, .Marketing, .Social, .Moda, .Dance and .Agency.